The survey was conducted to gather the following information concerning risk assessments in different member countries:  Different types of risk assessment used by jurisdictions. For example: o Screening (i.e. risk and hazard prioritisation) level versus a more detailed risk assessment; o Level of detail in the assessment; and o Jurisdictions which emphasize hazard more than risk/exposure;  Levels of uncertainties/assumptions used in these risk assessments;  Risk management measures and other outcomes of the assessment; and  Risk assessment process (es) used when evaluating manufactured nanomaterials including uncertainties, data requirements, and characterization/identification. The outcome of this project is an increased understanding of the details and scope of different regulatory risk assessments for manufactured nanomaterials by comparing and contrasting the conditions, assumptions, and levels of uncertainties of approaches utilised in different jurisdictions. Best practices could be identified that could be adopted by other countries. 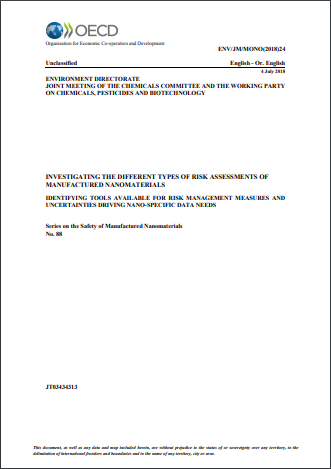 This report describes:  OECD Member countries approaches and activities regarding risk assessment and risk management of manufactured nanomaterials;  The different levels of uncertainties in those approaches and why these differences are present;  Common knowledge gaps most relevant to risk assessment and risk management approaches for manufactured nanomaterials; and 14 │ ENV/JM/MONO(2018)24 Unclassified  Recommendations on how risk assessments could be improved to reduce uncertainty regarding manufactured nanomaterials.